Pianos should be kept on inside walls. Fact: Pianos are much more sensitive to humidity than temperature. Since pianos are made of wood, it is not advisable to place pianos on top of heating vents where the sound board would be exposed to hot, dry air. It is also not advisable to put it in direct sunlight as this would cause the wood finish to fade. If the piano must be placed where in would be exposed to direct sunlight, an ebony or white polyester finish is preferable. Pianos must be tuned when they are moved. Strings stretch. Strings stretch throughout the life of the piano. New pianos have strings which have irregularities in its diameter. As the strings stretches, its diameter becomes more uniform, producing better tones. Thus, a new piano requires more tuning than an old one. Experts recommend four tunings for the first year and twice a year thereafter. Not tuning a piano this often will not cause damage to it; but it will delay the time the piano will reach its tonal potential. The older the strings, the less flexible they become. Soundboards move. Soundboards have cellular matter between the grains and these makes it susceptible to changes in humidity. During summer, these areas take on humidity causing the board to swell. Since the board is crowned, additional tension is forced on the string causing its pitch to go up or to go “sharp.” In addition, the increased tension may cause the tuning pins to slip or the strings to sit on a new spot at the bridge pins. During winter, when the humidity is reduced, the board shrinks resulting in an out-of-tune piano. Air conditioning and furnace humidifiers will help but will not totally eliminate the effects of seasonal changes in humidity. Pianos in tropical areas that is always humid or in deserts that is always dry are more stable with regard to its tuning. Soundboards with tighter grain are also less susceptible to changes in humidity. Tuning pins slips. If the wood holding the tuning pins (called “pin block” or wrest plank”) has dried out and is constricted, the tuning pins will not be able to hold the proper tension on the string causing the pitch to go flat either shortly or immediately after the tuning. This problem can only be corrected by replacing the pin block. Moving a piano with loose pins may cause it to go out of tune, but the problem was not caused by moving; it was caused by the defect in the piano itself. Defective pianos can have tuning problems related to other causes than those mentioned above. Not all pianos are handmade. Fact: All pianos are handmade. There is no other way to build them. Specialists work on different parts of the piano during the manufacturing process. The skills required to cast plates, cure or finish wood, fashion hammers, assemble actions and other processes are quite distinct from each other. No one person could be good at all of them. The relevant issues are the amount of labor and skill of the technicians. A Steinway piano, for instance, requires about 3,000 hours of labor; Asian pianos take about half that number of hours, others less. Steinway and Sons uses a rigorous apprenticeship-journeyman system; others simply assign hourly laborers to do specific jobs. Big companies which manufacture large quantities of piano make better pianos. Fact: Quality and quantity are very different things. Steinway and Sons builds excellent pianos but in limited quantities. Big Chinese manufacturers build many pianos at modest prices; there are big corporations who rely primarily on name recognition and huge advertising budgets to sell pianos, while only producing mediocre instruments. It is easy for manufacturers to blur the distinction between their best pianos, which are good enough to be used occasionally in concert halls, and their inexpensive models. 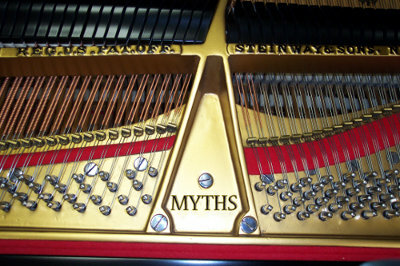 When comparing pianos made by the big companies, it is critical to find out how up the ladder a particular model rests. Small companies make better pianos. Fact: Not necessarily true. It is hard to be small and successful in the piano business. Steinway and Sons is the singular example of success in building pianos in small quantities, but they have had over 150 years experience in the business. Fact: Many dealers and manufacturers conduct big “event” sales at universities, high schools, concert halls, churches, exhibition halls or hotels, with teams of high-powered sales people and truckloads of pianos. These events cost thousands of dollars to conduct and the costs can only be recovered from the buyers of these pianos. In fact, the prices paid by the buyers are not necessarily lower than the price they could negotiate by walking into the dealer’s store and talking to the owner. No deal is ever a good deal if you are not happy with the piano over time. The best deal will be a purchase of a piano that you will come to love, even if it costs more than you expected to pay. The true price of a piano is somewhere between the list price and 70% off. Fact: Piano manufacturers do not publish Retail Price Lists, with the exception of some such as Steinway and Sons. Steinway has a New York Retail Price List, which is the price at which pianos are sold in their own store, the Steinway Hall, in New York. It also sets the glass ceiling price for all Steinway pianos being sold by their dealers. It is only possible to sell pianos at 40% to 70% off if they have been drastically overpriced in the first place. Some manufacturers do overprice their products in an effort to make them seem more valuable. They know the piano will be sold at a discount and this inflates the perceived savings. When you look at the net price (discounted price), it will probably be just about the lowest price that budget pianos are normally advertised for in the market. Steinway pianos, on the other hand, are priced fairly and are not discounted. When they are, it is usually in special cases such as sale of piano in churches and schools and the discounted price is only down to that of the New York Retail Price. A studio upright is just as good as a small grand. Shape. The grand piano is shaped the way it was designed by its inventor, Cristofori, about 300 years ago. The design of the soundboard is a variation of an obtuse oval similar to the shape of a violin or guitar. Such shape works well for tone production. Upright pianos are square and are designed to be practical and pretty. But square soundboards do not work as well for tone production. Confinement. A grand piano is open on the top and bottom allowing the tone to resonate throughout the room. Upright pianos are confined in wooden boxes and are placed close to walls. They are designed to project the sound out the back and reflect it off the wall. But they are usually set too close to the wall to allow the sound to resonate. Action. The action is everything between the key and hammer inclusive. A grand key is almost 30% longer than an upright key giving it a considerably better leverage and more dynamic range. Gravity works with a grand action, bringing the hammer and other parts to their resting positions quickly. Gravity works against an upright action so its action is not as responsive as that of a grand. Grands are better. That is why only grand pianos are usually played on stages or seen on CD covers and not uprights. Who Buys a Rebuilt Steinway?